Now blooming at Atlas Clothing, in Fremont. I've opened up a micro-boutique inside Atlas Clothing, a place after my own heart, full of local, vintage and pre-loved clothing and accessories. 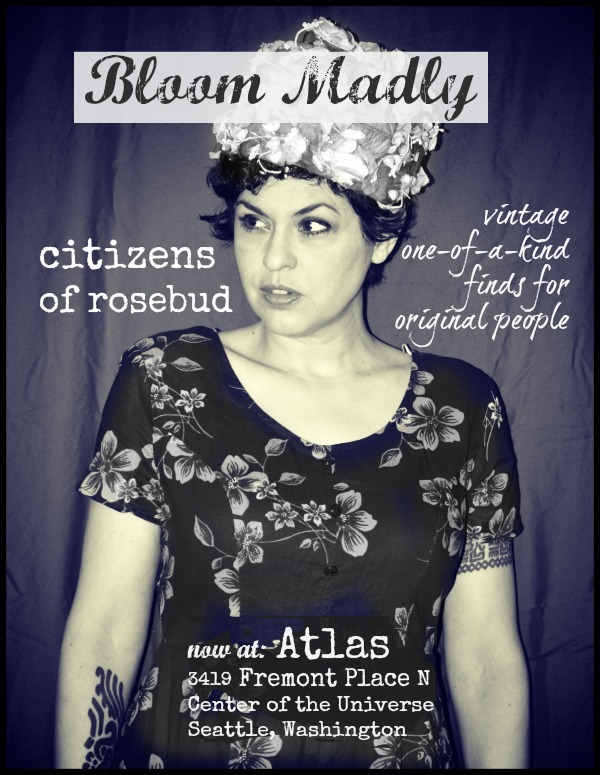 Inside this funky (Center of the Universe) Fremont space, in a corner of a room, you'll find Citizens of Rosebud, my fresh picks of vintage and pre-loves, blooming quietly amidst the riot. Friendly cashiers (say hi to Billy!) and affordable fashions, make this a great place to come + shop. Prices are modest, ranging from a few bucks to under $100. So if you're in Seattle, stop by and check out my shop. Look for the florals and rose prints, and the exclusive Citizens of Rosebud label. Atlas is open Monday-Saturday 11 am-7 pm, and Sunday from 11 am-6 pm. Ahora, quiero ir a Seattle para visitar tu tienda y conocerte! Le voy a prender una vela a San Miguel para que te de prosperidad y te provea muchas opportunidaddes. This makes me wish I was in Seattle! Best of luck! You are so positively fabulous! I adore the hat in your photo. All the best, Bella! I love the Freemont district---I spent a weekend shopping there once (do they still have the outdoor flea market?) and I even saw the Freemont Troll :) Gotta come up and pay the Citizens of Rosebud a visit. So cool! Wish I lived closer so I could visit. I hope it's a screaming success for you. How exciting for you. I'll have to check it out when I come to Seattle to see my dentist. How close are you to Waiting For The Interurban? You could dress them in Rosebud style for your Grand Opening. Exciting! Congrats and best of luck. I'll will be sure to come by on my next trip to your gorgeous city. I'm going to check it out when I get up to Seattle. I think I know the place. Good luck to you! One day ... Seattle and San Fransisco! Great! congrats ! And I fell in loove with that picture of you, don't you look DIVINE! wouua, these are really good news, wish you a great success and lots of fun!! I would love shopping there!! Congratulations Bella, so glad I could be a small part of this. I wish you every success and wish I could be there to see your stall. Congrats on you new store within a store Bella! Way to go, girl! Wishing you the best ever. I'd give anything to be able to hang out with you there, mind the store while you run out for coffee, talk to your cool friends, all that. I'm sure it will be a wild success with your taste and energy. Sending so much love as you step out in your new venture. Love you!! Street Feet: Have You Hugged Your Wildcat?